On Saturday, March 3, 2018 Carlos Santana rocked the “Rose City,” Portland, Oregon at the “Veteran’s Memorial Coliseum” at 8:00 PM, with his “Divination” tour. Unfortunately, the Trail Blazers were playing the Oklahoma City Thunder next door at the MODA Center on the same site. That meant that the parking lot was filled to capacity before the 8:00 PM concert took place, so there were only business parking lots turned into $40.00 pay for parking sites. We found one half a mile away for only $20.00 and could have parked for free a mile away, on some street, but I’d already had two cars stolen and one was after a concert, so I didn’t want a third. The show started with the mud sliding scene from 1969’s “Woodstock” documentary that first catapulted Santana into the International spotlight projected on the screen behind the stage. Band members emerged and took their places and played the percussion and drums as they sounded in the film in the introduction to “Soul Sacrifice,” until the organ broke in and then Carlos took over as his fingers danced on the fret board producing the dexterous guitar riffs that he’s been performing for the past fifty years. 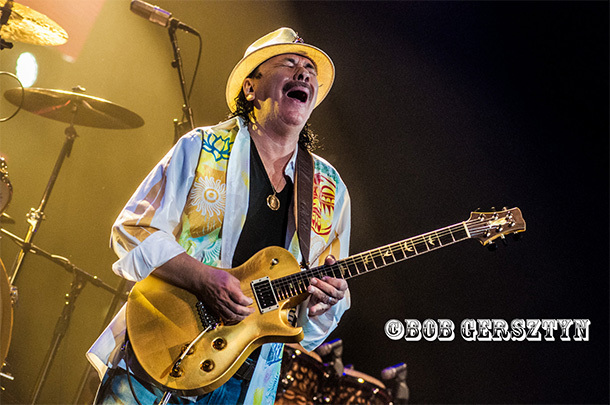 Santana is one of a handful of artists who came out of the 1960’s that has stood the test of time and are still performing, and still at the top of their game, fifty years later. Santana has had at least one Top Ten album in every decade since the 1960s until 2014 with the release of the fourteenth, Corazo`n. At the same time he’s won 10 Grammy Awards and was inducted into the rock & roll hall of fame in 1998 and has sold 100 million albums and performed for 100 millions fans. The set list for the show barely scratched the surface of the tunes from the nearly 40 album discography, but covered many of the major hits. The band was comprised of nine musicians, counting band leader Carlos Santana on lead guitar. The remaining eight were comprised of Carlos’s wife Cindy Blackman Santana – drums, Karl Perazzo – Timbales, Paoli Mejias – congas, Benjamin Rietveld – bass, Tommy Anthony – rhythm guitar, David Mathews – keyboards, Ray Green and Andy Vargas – vocals. “Soul Sacrifice” segued into “Jingo” with an organ intro until Carlos’s guitar exploded notes into the stratosphere as Green, Vargas and Carlos sang. “Evil Ways” was the third song off the debut album and demonstrated the bands virtuosity as phenomenal musicians in their own right supporting Santana’s stellar guitar shredding. A Santana concert involves multiple senses as rich visuals interact with the musical directions. Visuals are projected throughout the show that display images of peace, love, pain and sorrow that accompany the musical direction of the band. Visual effects of a Santana concert are an important supplement to the music, using the backdrop, projected images and complex multi layered stage lighting were constantly changing colors and visuals to support the song being performed. It was a complete multi-media blowout, whose roots reach back to the psychedelic 1960s when venues like the Filmore in San Francisco and venues across the country incorporated light shows with rock concerts. Carlos played his guitar with the clean and rich sound that made him the guitar god that he is and then dove into “A Love Supreme,” from John Coltrane’s 1965 album of the same name. 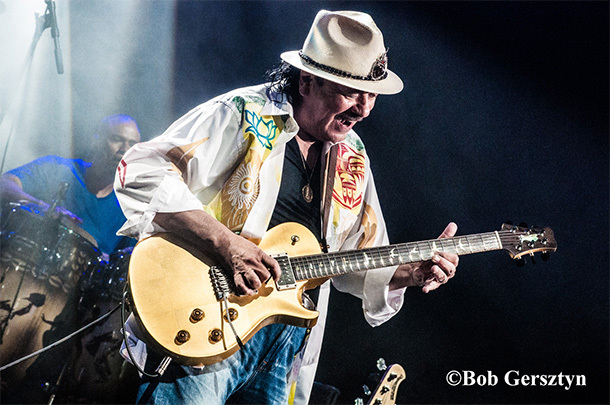 Throughout the concert Carlos would sometimes veer off the song and incorporate a segment of another as he played a searing solo from the “Beatles,” Eric Clapton solo, “While My Guitar Gently Weeps.” This segued into “Black Magic Woman,” the “Fleetwood Mac” song written by Peter Green, that Santana made his own hit record in 1970. Keyboardist David Mathews was a dominant presence throughout the show with his virtuosity and took a number of solos throughout the night. By the time that the band was performing “Oye Como Va” the crowd was hysterical with excitement as Mathews led the introduction with his organ gymnastics, as Carlos played notes until Paoli Mejas took over on congas and led the entire rhythm section into a frantic beat. Green danced as he shook two tambourines and sang alongside Vargas who was beating a wood block with a clave as they sang together. Carlos Santana performs in Portland, Oregon. Green and Vargas dominated with their vocals as they dove right into “No One To Depend On” off 1972’s Santana III. The song was a long jam that gave everyone in the band an opportunity to do a short solo. Then Carlos thanked the crowd for coming and spending the night together and talked about how Jerry Garcia, Miles Davis, Jimi Hendrix and all the other great artists that have passed before us were present and with us tonight, on a spiritual plane. “They are here with us tonight,” Carlos announced and continued, “we want to end fear and we want joy to replace it. We want to transmogrify the planet, he said as an introduction to “She’s Not There,” the 1964 hit by the Zombies that Santana made a hit for the second time when he recorded it in 1977 on the Moonflower album. Rietveld thumped his bass as a foundation for Mathews’ keyboard playing, a shrill high pitched tone until Santana began to hit some metallic notes as a lead in for his spouse drummer Cindy Blackman Santana to play a short solo, until Carlos took back over and led the rest of the band into a short jam that concluded the song. Santana began playing Hendrix’s “Voodoo Child Slight Return” on his guitar as Green came forward with a trombone and took over for a minute until Carlos came back with a vengeance. Green and Vargas sang “chop it down with the edge of my hand,” over and over again as Santana squeezed notes out of his “PRS Santana III” guitar. Next came another tune from Power of Peace, a cover of Swamp Dog’s LSD influenced composition from the 1960s, “Total Destruction of the Mind,” with Ray Green singing lead with Mathews breaking in and jamming as the lead instrument with the spotlight shinning on him as he pounded his electric piano like a maniac until Carlos came in and then they sang, na, na, na, na, na, na, as Carlos began playing the “Rolling Stones’s “Satisfaction” Then after jamming for five minutes, they concluded with “Total Destruction of the Mind,” in a super psychedelic mode. Suddenly they changed gears and Carlos and rhythm guitarist Tommy Anthony faced each other and played together until Carlos broke off and played a soaring solo lead, as Anthony strummed chords. Carlos was standing in front of the stage wailing on his guitar as the crowd expressed its adoration. Green once again came forward with trombone and played, until Blackman and Perazzo played their drums in tandem. The entire band jammed and Vargas had everyone stand up and then start jumping around pogo dancing as Green played trombone and the band jammed to high heaven. Next “Foo Foo” from 2002’s Shaman album had Santana walking up and down the stage under a green spot light as Green and Vargas stood at the edge of the stage on the far left and right singing. Carlos grabbed a clave and block and began the song by beating it until he replaced them with his guitar as he danced on the fretboard with his fingers playing “Corazon Espinado,” with Mathews’s organ sounding like the “Iron Butterfly’s” Doug Ingle’s. Then Carlos dove into “Chim, Chim, Cheri” from “Mary Poppins,” until he began to pick flatted fifth’s as he descended into a minimalistic approach on his axe with precise picking until everyone burst into an intense jam. At 10:00 PM the two hour set ended and the band left the stage to whistling, screams and applause. Images of Buddhist monks and icons and statues were projected on the screen until Western ones replaced them and then the band returned to the stage and began playing “Are You Ready People” from the Power of Peace album with Carlos wailing on his guitar as Green and Vargas sang, “A A A A Ya Ya Ya A A A,” until Cindy began a drum solo and everyone left the stage. With the modern technology of the video screen present at all large venue shows you can appreciate all the angles that are impossible to see without it. Like from the inside of the drum kit. Then Green took over on vocals and the percussion dominated until Carlos came back wailing on his guitar. Carlos walked up to the edge of the stage as he introduced Sam Mathews on keyboard and then the rest of the lineup as they began playing “Roxanne” by the “Police,” and then segued into “Love, Peace and Happiness,” which Santana had just recorded and released on 2017’s Power of Peace album recorded with the “Isley Brothers.” The song was the title song off psychedelic soul band, “The Chambers Brothers’s” 1969 album. It was a civil rights song with the screen showing marches as Green sang higher, higher, higher, while the band jammed and Santana continued to demonstrate why “Rolling Stone Magazine” rated him as the #15 Greatest Guitar Player of all time. “Love, peace, happiness, whoa, whoa, whoa, peace and happiness,” Green and Vargas sang as images of Mother Teresa, Nelson Mandala and Ghandi were projected on the screen. “Love, Peace and Happiness” was not just about peace and love, but the unity of humanity. “No more war, no more war, only love of the highest good” as the band chanted, “no more war, no more hate, only love of the highest good, everyone chanted until the lights came on and the band left the stage. The final score was Trailblazers 108, Thunder 100. « Top 2 Jimi Hendrix concerts that captured him at his spellbinding best! Oh man! I’m just seeing this now and wishing I had been there for it! Was at Cape Cod coliseum in 81!!!!! Fantastic!!!!!! !